Background: Diabetes mellitus is associated with cognitive deficits in humans and animals. These deficits are paralleled by neurophysiological and structural changes in brain. In diabetic animals, impairments of spatial learning, memory, and cognition occur in association with distinct changes in hippocampus, a key brain area for many forms of learning and memory and are particularly sensitive to changes in glucose homeostasis. However, the multifactorial pathogenesis of diabetic encephalopathy is not yet completely understood. Apoptosis plays a crucial role in diabetes-induce neuronal loss in hippocampus. Methods: The effects of diabetes on hippocampus and cognitive/behavioral dysfunctions in experimental models of diabetes are reviewed, with a focus on the negative impact on increased neuronal apoptosis and related cellular and molecular mechanisms. Results: Of all articles that were assessed, most of the experimental studies clearly showed that diabetes causes neuronal apoptosis in hippocampus through multiple mechanisms, including oxidative stress, inhibition of caspases, disturbance in expression of apoptosis regulator genes, as well as deficits in mitochondrial function. The balance between pro-apoptotic and anti-apoptotic signaling may determine the neuronal apoptotic outcome in vitro and in vivo models of experimental diabetes. Conclusions: Dissecting out the mechanisms responsible for diabetes-related changes in the hippocampal cell apoptosis helps improve treatment of impaired cognitive and memory functions in diabetic individuals. The keywords "diabetes," "Apoptosis," and "hippocampus" were searched in PubMed, MEDLINE, and EMBASE databases with the following limits: English language and published in the last 15 years (2001-2015). Article titles and abstracts were screened, and potentially relevant articles were retrieved and evaluated. 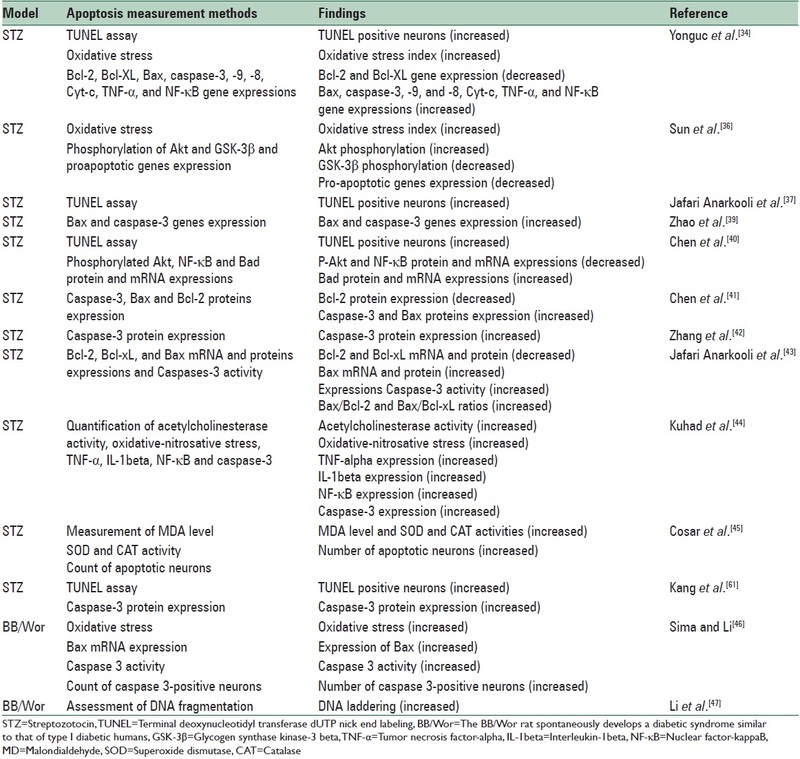 This review included published studies that examined the effect of diabetes on hippocampal apoptosis [Table 1], and it summarizes and synthesizes the highlights of the selected articles. The known cellular and molecular mechanisms involved in hippocampus neuronal apoptosis (i.e., gene regulators, caspases activity, and oxidative stress) are also discussed. Most of the reviewed behavioral studies involved the evaluation of hippocampal apoptosis in a model of experimental diabetes. In summary, diabetes is associated with an "encephalopathy" characterized by slowly progressive, clinically prominent cognitive impairments accompanied by brain neurophysiological and structural disorders. A better understanding of the underlying mechanisms may allow us to challenge the concept that the accelerated cognitive decline in these individuals is an irrevocable process. In the previous work, Jakobsen et al. showed a significant loss of neocortical neurons in STZ-induced diabetic rats. Neuronal apoptosis also occurs in the hypothalamic nuclei in the diabetic Chinese hamster. The nature of neuronal apoptosis was not defined in these early studies or it was determined as to whether neuronal loss was associated with cognitive impairments. Preclinical literature consistently reports that the hippocampal environment of diabetic animals favors apoptosis, as evidenced by significant elevations in apoptotic markers [Table 1] and [Table 2]. In the type 1 diabetic rat, neuronal counts of hippocampal pyramidal cells were performed in the hippocampal sub-regions (CA1-CA4) and found no significant differences at 2 months of diabetes. Nevertheless, there was 37% and 24% loss of pyramidal cells in the CA1 and CA2 regions, respectively, in 8 months diabetic animals, and no significant decreases were reported in neuronal densities of other hippocampal sub-regions. These data suggest a duration-related effects of diabetes on neuronal density decline in hippocampus. There are also several in vitro and in vivo studies indicating that hippocampal neuronal loss occurs in diabetic animals and this may be a major contributing mechanism to memory and learning impairments. , There is some evidence demonstrating no apoptosis in hippocampal pyramidal neurons or any cognitive deficits in 8 weeks diabetic rats. On the other hand, in 8 months diabetic rats, terminal deoxynucleotidyl transferase-mediated dUTP nick end-labeled positive neurons, positive DNA laddering, increased Bax expression, and caspase 3 activity were evident and related to decreased neuronal density and impaired Morris water maze performances [Table 1] and [Table 2]. ,,,,,, Therefore, duration-related apoptosis is likely to account for the neuronal loss and the concomitant emergence of cognitive impairments in the diabetic animals. It is now well-established that diabetes mellitus is associated with impaired cognitive function in human and animals. Animal models of both type 1 and 2 diabetes mellitus have confirmed the detrimental effect of chronic high blood glucose levels on learning and memory. Experimentally, learning and memory deficits in STZ-diabetic rats have been associated with neuronal loss, apoptosis induction in neurons of hippocampus. In addition, recent studies revealed the dark neuron production in hippocampus of diabetic rats. Apoptosis is an active, tightly regulated, metabolic, and genetically encoded form of cell death, in which any harm done to the organism by this process is minimized. It may occur during normal physiological or pathological conditions such as diabetes mellitus. Apoptosis is well-regulated by several internal and external regulators such as expression of a number of (pro-apoptotic and anti-apoptotic) genes. Dissecting out the mechanisms responsible for the induction of apoptosis in hippocampal neurons that partially reflects the effects of diabetes on learning and memory impairments observed in diabetic human and animals helps to improve the therapy. The development of diabetes complications is directly dependent on the duration of the disease and the quality of metabolic control. Until now, it can only be partially prevented by intensive insulin treatment. This research was supported by Isfahan University of Medical Sciences (Grant No. 393026). Cosson E. Diagnostic criteria for gestational diabetes mellitus. Diabetes Metab 2010;36(6 Pt 2):538-48. Khan MN, Khan FA, Sultana S, Dilawar M, Ijaz A, Khan MJ, et al. Impact of new diagnostic criteria of diabetes mellitus. J Coll Physicians Surg Pak 2007;17:327-30. Dagogo-Jack S, Santiago JV. Pathophysiology of type 2 diabetes and modes of action of therapeutic interventions. Arch Intern Med 1997;157:1802-17. Yi SS. Effects of exercise on brain functions in diabetic animal models. World J Diabetes 2015;6:583-97. Tran L, Zielinski A, Roach AH, Jende JA, Householder AM, Cole EE, et al. Pharmacologic treatment of type 2 diabetes: Oral medications. Ann Pharmacother 2015;49:540-56. Conde Barreiro S, Rodríguez Rigual M, Bueno Lozano G, López Siguero JP, González Pelegrín B, Rodrigo Val MP, et al. Epidemiology of type 1 diabetes mellitus in children in Spain. An Pediatr (Barc) 2014;81:189.e1-12. Huber CA, Schwenkglenks M, Rapold R, Reich O. Epidemiology and costs of diabetes mellitus in Switzerland: An analysis of health care claims data, 2006 and 2011. BMC Endocr Disord 2014;14:44. Harris MI. Epidemiology of diabetes mellitus among the elderly in the United States. Clin Geriatr Med 1990;6:703-19. Harris MI, Hadden WC, Knowler WC, Bennett PH. Prevalence of diabetes and impaired glucose tolerance and plasma glucose levels in U.S. population aged 20-74 yr. Diabetes 1987;36:523-34. Cukierman-Yaffe T. Diabetes, dysglycemia and cognitive dysfunction. Diabetes Metab Res Rev 2014;30:341-5. Reijmer YD, van den Berg E, Ruis C, Kappelle LJ, Biessels GJ. Cognitive dysfunction in patients with type 2 diabetes. Diabetes Metab Res Rev 2010;26:507-19. Alvarez EO, Beauquis J, Revsin Y, Banzan AM, Roig P, De Nicola AF, et al. Cognitive dysfunction and hippocampal changes in experimental type 1 diabetes. Behav Brain Res 2009;198:224-30. Matanovic D, Popovic S, Parapid B, Dubljanin E, Stanisavljevic D, Ille T. Evaluation of neurophysiological parameters and good metabolic control in patients with type 1 diabetes mellitus. Srp Arh Celok Lek 2012;140:285-9. Zhou X, Zhang J, Chen Y, Ma T, Wang Y, Wang J, et al. Aggravated cognitive and brain functional impairment in mild cognitive impairment patients with type 2 diabetes: A resting-state functional MRI study. J Alzheimers Dis 2014;41:925-35.
van Harten B, Oosterman JM, Potter van Loon BJ, Scheltens P, Weinstein HC. Brain lesions on MRI in elderly patients with type 2 diabetes mellitus. Eur Neurol 2007;57:70-4. Meece J. Diabetes mellitus: Pathophysiology and complications. Int J Pharm Compd 2003;7:17-20. Mooradian AD. Pathophysiology of central nervous system complications in diabetes mellitus. Clin Neurosci 1997;4:322-6. Pirart J. Diabetes mellitus and its degenerative complications: A prospective study of 4,400 patients observed between 1947 and 1973 (3 rd and last part) (author's transl). Diabete Metab 1977;3:245-56. Gispen WH, Biessels GJ. Cognition and synaptic plasticity in diabetes mellitus. Trends Neurosci 2000;23:542-9. Chuiko MR, Bodykhov MK, Skvortsova VI. Characteristics and peculiarities of the course of encephalopathy in diabetes mellitus. Zh Nevrol Psikhiatr Im S S Korsakova 2010;110(5 Pt 1):4-8. Brands AM, Henselmans JM, de Haan EH, Biessels GJ. Diabetic encephalopathy: An underexposed complication of diabetes mellitus. Ned Tijdschr Geneeskd 2003;147:11-4. Strachan MW, Deary IJ, Ewing FM, Frier BM. Is type II diabetes associated with an increased risk of cognitive dysfunction? A critical review of published studies. Diabetes Care 1997;20:438-45. Ma L, Wang J, Li Y. Insulin resistance and cognitive dysfunction. Clin Chim Acta 2015;444:18-23. Diabetes Control and Complications Trial/Epidemiology of Diabetes Interventions and Complications Study Research Group, Jacobson AM, Musen G, Ryan CM, Silvers N, Cleary P, et al. Long-term effect of diabetes and its treatment on cognitive function. N Engl J Med 2007;356:1842-52. Bryan RN, Bilello M, Davatzikos C, Lazar RM, Murray A, Horowitz K, et al. Effect of diabetes on brain structure: The action to control cardiovascular risk in diabetes MR imaging baseline data. Radiology 2014;272:210-6. Ferguson SC, Blane A, Perros P, McCrimmon RJ, Best JJ, Wardlaw J, et al. Cognitive ability and brain structure in type 1 diabetes: Relation to microangiopathy and preceding severe hypoglycemia. Diabetes 2003;52:149-56. Musen G, Lyoo IK, Sparks CR, Weinger K, Hwang J, Ryan CM, et al. Effects of type 1 diabetes on gray matter density as measured by voxel-based morphometry. Diabetes 2006;55:326-33. Sima AA, Kamiya H, Li ZG. Insulin, C-peptide, hyperglycemia, and central nervous system complications in diabetes. Eur J Pharmacol 2004;490:187-97. Huber JD, VanGilder RL, Houser KA. Streptozotocin-induced diabetes progressively increases blood-brain barrier permeability in specific brain regions in rats. Am J Physiol Heart Circ Physiol 2006;291:H2660-8. Sridhar GR, Lakshmi G, Nagamani G. Emerging links between type 2 diabetes and Alzheimer's disease. World J Diabetes 2015;6:744-51. Yonguc GN, Dodurga Y, Adiguzel E, Gundogdu G, Kucukatay V, Ozbal S, et al. Grape seed extract has superior beneficial effects than Vitamin E on oxidative stress and apoptosis in the hippocampus of streptozotocin induced diabetic rats. Gene 2015;555:119-26. Ghasemi R, Zarifkar A, Rastegar K, Maghsoudi N, Moosavi M. Insulin protects against Aß-induced spatial memory impairment, hippocampal apoptosis and MAPKs signaling disruption. Neuropharmacology 2014;85:113-20. Sun LJ, Hou XH, Xue SH, Yan F, Dai YJ, Zhao CH, et al. Fish oil modulates glycogen synthase kinase-3 signaling pathway in diabetes-induced hippocampal neurons apoptosis. Brain Res 2014;1574:37-49. Jafari Anarkooli I, Barzegar Ganji H, Pourheidar M. The protective effects of insulin and natural honey against hippocampal cell death in streptozotocin-induced diabetic rats. J Diabetes Res 2014;2014:491571. Alipour M, Salehi I, Ghadiri Soufi F. Effect of exercise on diabetes-induced oxidative stress in the rat hippocampus. Iran Red Crescent Med J 2012;14:222-8. Zhao CH, Liu HQ, Cao R, Ji AL, Zhang L, Wang F, et al. Effects of dietary fish oil on learning function and apoptosis of hippocampal pyramidal neurons in streptozotocin-diabetic rats. Brain Res 2012;1457:33-43. Chen Z, He Y, Song C, Dong Z, Su Z, Xue J. Sericin can reduce hippocampal neuronal apoptosis by activating the Akt signal transduction pathway in a rat model of diabetes mellitus. Neural Regen Res 2012;7:197-201. Chen Y, Li L, Li Z, Huang X, Zhang L, Chen W. Effects of naokang erhao decoction on cognitive ability and hippocampal apoptosis-related proteins in diabetic rats. Zhongguo Zhong Yao Za Zhi 2011;36:1519-23. Zhang T, Jia W, Sun X. 3-n-butylphthalide (NBP) reduces apoptosis and enhances vascular endothelial growth factor (VEGF) up-regulation in diabetic rats. Neurol Res 2010;32:390-6. Jafari Anarkooli I, Sankian M, Ahmadpour S, Varasteh AR, Haghir H. Evaluation of Bcl-2 family gene expression and caspase-3 activity in hippocampus STZ-induced diabetic rats. Exp Diabetes Res 2008;2008:638467. Kuhad A, Bishnoi M, Tiwari V, Chopra K. Suppression of NF-kappabeta signaling pathway by tocotrienol can prevent diabetes associated cognitive deficits. Pharmacol Biochem Behav 2009;92:251-9. Cosar M, Songur A, Sahin O, Uz E, Yilmaz R, Yagmurca M, et al. The neuroprotective effect of fish n-3 fatty acids in the hippocampus of diabetic rats. Nutr Neurosci 2008;11:161-6. Sima AA, Li ZG. The effect of C-peptide on cognitive dysfunction and hippocampal apoptosis in type 1 diabetic rats. Diabetes 2005;54:1497-505. Li ZG, Zhang W, Sima AA. C-peptide prevents hippocampal apoptosis in type 1 diabetes. Int J Exp Diabetes Res 2002;3:241-5. Biessels GJ, Kamal A, Ramakers GM, Urban IJ, Spruijt BM, Erkelens DW, et al. Place learning and hippocampal synaptic plasticity in streptozotocin-induced diabetic rats. Diabetes 1996;45:1259-66. Popoviç M, Biessels GJ, Isaacson RL, Gispen WH. Learning and memory in streptozotocin-induced diabetic rats in a novel spatial/object discrimination task. Behav Brain Res 2001;122:201-7. Flood JF, Mooradian AD, Morley JE. Characteristics of learning and memory in streptozocin-induced diabetic mice. Diabetes 1990;39:1391-8. Chen L, Gong S, Shan LD, Xu WP, Zhang YJ, Guo SY, et al. Effects of exercise on neurogenesis in the dentate gyrus and ability of learning and memory after hippocampus lesion in adult rats. Neurosci Bull 2006;22:1-6. Kamal A, Biessels GJ, Duis SE, Gispen WH. Learning and hippocampal synaptic plasticity in streptozotocin-diabetic rats: Interaction of diabetes and ageing. Diabetologia 2000;43:500-6. Biessels GJ, Kamal A, Urban IJ, Spruijt BM, Erkelens DW, Gispen WH. Water maze learning and hippocampal synaptic plasticity in streptozotocin-diabetic rats: Effects of insulin treatment. Brain Res 1998;800:125-35. Pamidi N, Satheesha Nayak BN. Effect of streptozotocin induced diabetes on rat hippocampus. Bratisl Lek Listy 2012;113:583-8. Foghi K, Ahmadpour S. Diabetes mellitus type1 and neuronal degeneration in ventral and dorsal hippocampus. Iran J Pathol 2014;9:33. Witter M, Amaral DG. The Rat Nervous System. California, USA: Elsevier Academic; 2004. Squire LR. Memory and the hippocampus: A synthesis from findings with rats, monkeys, and humans. Psychol Rev 1992;99:195-231. Lewis S. Learning and memory: Hippocampus plays multiple choice. Nat Rev Neurosci 2012;13:600. Turgut YB, Turgut M. A mysterious term hippocampus involved in learning and memory. Childs Nerv Syst 2011;27:2023-5. Jarrard LE. On the role of the hippocampus in learning and memory in the rat. Behav Neural Biol 1993;60:9-26. Kang JO, Kim SK, Hong SE, Lee TH, Kim CJ. Low dose radiation overcomes diabetes-induced suppression of hippocampal neuronal cell proliferation in rats. J Korean Med Sci 2006;21:500-5. Kitamura T, Inokuchi K. Role of adult neurogenesis in hippocampal-cortical memory consolidation. Mol Brain 2014;7:13. Koehl M, Abrous DN. A new chapter in the field of memory: Adult hippocampal neurogenesis. Eur J Neurosci 2011;33:1101-14. Kitabatake Y, Sailor KA, Ming GL, Song H. Adult neurogenesis and hippocampal memory function: New cells, more plasticity, new memories? Neurosurg Clin N Am 2007;18:105-13, x. Van der Borght K, Havekes R, Bos T, Eggen BJ, Van der Zee EA. Exercise improves memory acquisition and retrieval in the Y-maze task: Relationship with hippocampal neurogenesis. Behav Neurosci 2007;121:324-34. Kobilo T, Yuan C, van Praag H. Endurance factors improve hippocampal neurogenesis and spatial memory in mice. Learn Mem 2011;18:103-7. Choi JH, Hwang IK, Yi SS, Yoo KS, Lee CH, Shin HC, et al. Effects of streptozotocin-induced type 1 diabetes on cell proliferation and neuronal differentiation in the dentate gyrus; correlation with memory impairment. Korean J Anat 2009;42:41-8. Zhang WJ, Tan YF, Yue JT, Vranic M, Wojtowicz JM. Impairment of hippocampal neurogenesis in streptozotocin-treated diabetic rats. Acta Neurol Scand 2008;117:205-10. Li ZG, Zhang W, Grunberger G, Sima AA. Hippocampal neuronal apoptosis in type 1 diabetes. Brain Res 2002;946:221-31. Ahmadpour S, Sadeghi Y, Sheibanifar M, Haghir H. Neuronal death in dentate gyrus and ca3 in diabetic rats: Effects of insulin and ascorbic acid. Hormozan J Med Sci 2010;13:13-6. Winkler G, Kempler P. Pathomechanism of diabetic neuropathy: Background of the pathogenesis-oriented therapy. Orv Hetil 2010;151:971-81. Vinik AI. Diabetic neuropathy: Pathogenesis and therapy. Am J Med 1999;107:17S-26S. Umanskii SP. Apoptosis: Molecular and cellular mechanisms. Mol Biol (Mosk) 1996;30:487-502. Hung RW, Chow AW. Apoptosis: Molecular mechanisms, regulation and role in pathogenesis. Can J Infect Dis 1997;8:103-9. Topuridze ML, Kipiani VA, Pavliashvili NS, Kipiani NV, Petriashvili TG. Molecular mechanisms of apoptosis. Georgian Med News 2007;150:38-45. Radi E, Formichi P, Battisti C, Federico A. Apoptosis and oxidative stress in neurodegenerative diseases. J Alzheimers Dis 2014;42 Suppl 3:S125-52. Conradt B. Genetic control of programmed cell death during animal development. Annu Rev Genet 2009;43:493-523. Fuchs Y, Steller H. Programmed cell death in animal development and disease. Cell 2011;147:742-58. Yuan J, Horvitz HR. A first insight into the molecular mechanisms of apoptosis. Cell 2004;116 2 Suppl:S53-6. Jakobsen J, Sidenius P, Gundersen HJ, Osterby R. Quantitative changes of cerebral neocortical structure in insulin-treated long-term streptozocin-induced diabetes in rats. Diabetes 1987;36:597-601. Garris DR, Diani AR, Smith C, Gerritsen GC. Depopulation of the ventromedial hypothalamic nucleus in the diabetic Chinese hamster. Acta Neuropathol 1982;56:63-6. Verhagen AM, Vaux DL. Molecular mechanisms of apoptosis: An overview. Results Probl Cell Differ 1999;23:11-24. Schwartzman RA, Cidlowski JA. Apoptosis: The biochemistry and molecular biology of programmed cell death. Endocr Rev 1993;14:133-51. Kukhta VK, Marozkina NV, Sokolchik IG, Bogaturova EV. Molecular mechanisms of apoptosis. Ukr Biokhim Zh (1999) 2003;75:5-9. Oyenihi AB, Ayeleso AO, Mukwevho E, Masola B. Antioxidant strategies in the management of diabetic neuropathy. Biomed Res Int 2015;2015:515042. Johansen JS, Harris AK, Rychly DJ, Ergul A. Oxidative stress and the use of antioxidants in diabetes: Linking basic science to clinical practice. Cardiovasc Diabetol 2005;4:5. Sonoda N, Inoguchi T. Role of oxidative stress in pathogenesis of diabetic complications. Nihon Rinsho 2012;70 Suppl 5:231-5. Matough FA, Budin SB, Hamid ZA, Alwahaibi N, Mohamed J. The role of oxidative stress and antioxidants in diabetic complications. Sultan Qaboos Univ Med J 2012;12:5-18. Van Dam PS, Van Asbeck BS, Erkelens DW, Marx JJ, Gispen WH, Bravenboer B. The role of oxidative stress in neuropathy and other diabetic complications. Diabetes Metab Rev 1995;11:181-92. Niedowicz DM, Daleke DL. The role of oxidative stress in diabetic complications. Cell Biochem Biophys 2005;43:289-330.
de Oliveira DM, Ferreira Lima RM, El-Bachá RS. Brain rust: Recent discoveries on the role of oxidative stress in neurodegenerative diseases. Nutr Neurosci 2012;15:94-102. Shibata N, Kobayashi M. The role for oxidative stress in neurodegenerative diseases. Brain Nerve 2008;60:157-70. Potashkin JA, Meredith GE. The role of oxidative stress in the dysregulation of gene expression and protein metabolism in neurodegenerative disease. Antioxid Redox Signal 2006;8:144-51.